How and when did you become involved in ultra-sound? I graduated from the University of Sydney in March 1959 with a Bachelor degree in Science in Physics and Mathematics and a First Class Honors degree in Electrical Engineering. At that time I considered applying for a position as research scientist in nuclear physics at the Atomic Energy Commission.The day after the results were announced, Norman Murray, the Director of the Common-wealth Acoustic Laboratories, approached me and invited me to set up and head the to be formed Ultrasonics Research Section at the Laboratories. Murray had been keeping an eye on the emerging publications on medical ultrasound. He had attended a meeting of the NHMRC where concern was expressed regarding the use of X-rays in pregnancy and was aware of the first publication by Donald on the use of ultrasound to investigate abdominal masses. He felt that Australia should also begin to undertake research into this emerging field of medical ultrasound and that the Acoustic Laboratories were an appropriate venue for this research. Norm Murray persuaded me to accept his invitation on the basis of his description of medical ultrasound as a field in the early stages development where it would be easier to make meaningful contributions. As there was no one in Australia with experience in ultra-sound I was to report directly to him as a Section Head. In recognition of this responsibility my appointment would be at a grade higher than that normally offered to a raw graduate. In other words he made me an offer which I just could not refuse and I commenced duties at the Laboratories on 10th of March 1959. At that time seven groups were undertaking research into medical ultrasound. In the Unit-ed States, Wild and Reid in Minneapolis were investigating imaging the breast, Howry and Holmes in Denver the abdomen, Baum in New York the eye, while Fry and his team in Champaign-Urbana were using high intensity ultrasound to create trackless lesions in the brain. In Europe, Donald in Glasgow was applying ultrasound to examine the pregnant uterus while Edler and Hertz in Malmo were studying the applications of M-mode to image the heart. Finally in Japan, Wagai in Tokyo was the second investigator to begin to image the breast. Our research into obstetrical applications commenced in September 1959 with the appointment of Bill Garrett as clinical consultant to the Section. We were thus the second group internationally to begin research into imaging in obstetrics. Were there any particular people that influenced your work? I was very fortunate to have had capable colleagues who wanted to join our Section and to collaborate with all as an interdisciplinary team. There were no walls between researchers working on different projects nor from our medical consultants in different professions. Ideas were exchanged freely in weekly review meetings where our successes, obstacles or failures were presented and discussed. In this way we all contributed to-wards our common objective of advancing our knowledge and contributions to medical ultra-sound. I would however like however to single out several individuals who made major contributions that influenced my work. Internationally -I was very much impressed by the work of Doug Howry and Joe Holmes who, using the water coupling technique, published detailed images of the human neck and lower limb. This was the main reason as to why our Section, later to become the independent Ultrasonics Institute, chose this approach to examine the pregnant abdomen and the breast. I also closely followed the research conducted by Bill Fry and his team who put together a team of scientists, engineers and medical doctors to produce trackless lesions in the human brain and used this method to study the interconnections between nuclei in the brain of the cat. Australia -I was introduced to various aspects of clinical practice by Bill Garrett in obstetrics and by Tom Reeve in the breast. They were both excellent teachers and with time we developed a team approach to identify the structures in the human body that had not been previously imaged by ultrasound. The imaging of artifacts posed challenges but with time we learned how to identify those and even obtain useful clinical data from their portrayal. In was not uncommon for us to publish technical or clinically oriented papers depending on who was the senior person making the original observation and putting it into practice. Dave Robinson joined the Section eighteen months after my appointment. We had mutual respect for each other abilities and developed a close working relationship. Dave was a practical man and was the person in charge of designing the electronic signal processing and mechanical requirements of our scanners. My contributions lay in the philosophical approaches as to how to handle the complex data acquired by the scanners and in the design and construction of the transducers used in our research.In 1975 we developed the UI Octoson. In this scanner the patient lay essentially on a water bed and was examined from below by eight annular array transducers. Single and com-pound scans were obtained quickly and all the features of the scanner were controlled by a computer. Many radiologists and obstetricians expressed interest in acquiring this equipment. The Australian Government went to tender to select the company to manufacture this scanner and the Nucleus Group was selected to do so. The Chairman of the Group was Paul Trainor, an Australian enterprenor, who had set up several medical companies including Telectronics and Cochlear. Ausonics Pty Ltd was established to build the UI Octoson and I was asked to help Paul introduce the scanner to the market. This included many meetings with individuals and companies interested in the venture. Paul, a true gentleman, was an excellent negotiator and I learned a lot from him how markets work. The UI Octoson was manufactured in Sydney and over five years nearly two hundred of these scanners were sold world wide. What were your career highlights? 1959 Joined the Commonwealth Acoustic Laboratories and began research into medical ultrasound. 1962 Obtained our first black and white ob-stetrical scans. The outline of the fetal head and trunk were clearly displayed as well as some internal fetal organs such as the spine, the heart and the bladder. This allowed us to make accurate assessment of fetal wellbeing from size measurements, diagnosis of asymmetrical growth retardation and of anomalies that cause bladder obstruction. 1963 Developed techniques to measure the acoustic output of therapeutic and diagnostic transducers. This allowed us to measure the output of different transducer designs and to select those that minimized patient exposure. 1965 With Bill Garrett as senior author published the first detailed paper on our ability to visualize the fetus and the clinical relevance of this information. 1967-1969 Two year sabbatical with Bill Fry. Bill was putting together a scanner which had lesion making as well as imaging capabilities. Bill at that time was President of the AIUM and he appointed me Vice President to help stage the AIUM 1968 Congress. AIUM Congresses had been focused mainly on physio-therapy applications and biological effects. I was interested in incorporating diagnostic imaging as a major component of the 1968 Congress. Unfortunately Bill died suddenly in 1968 and, as stipulated in the AIUM by-laws, I became President for the next year and a half. This Congress marked the transition of the AIUM from a physiotherapy focused organization to one whose major interests are diagnostic applications. 1969 Establishment of ASUM Shortly before my return to AustraIia, I attended the First Congress of WFUMB held in Vienna. On my return I presented a summary of that Congress at an ad hoc meeting of the staff, our medical consultants and other individuals who had an interest in diagnostic ultrasound. At that meeting it was unanimously agreed that a society representing Australian interest should be formed and be named the Australian Society of Ultrasound in Medicine. I had the privilege of being elected Foundation President of the Society and served in that capacity for the next two years. The Society flourished and undertook action not only to promote scientific and clinical applications but also to concentrate on issues of education. One of my greatest satisfactions is to see ASUM flourish to the extent that it has achieved to date, and to see the use of ultrasound in Australia second to none. 1969 Development of Grey Scale Imaging. During the last month of my stay in Illinois, I noted that when medium levels of power out-put were used to image the liver of the cat, the soft tissues reflected echoes of similar size irrespective of the direction of the scanning beam. I realized that the texture of soft tissue reflected the ultrasound energy in a diffuse manner. This was in stark contrast to the specular echoes obtained from large inter-faces with which we were familiar. This led us to redesign transducers and signal processing to display, for the first time, the diffusely reflected echoes -in effect, the first grey scale images. Jack Jellins and I implemented grey scale imaging late that year on our breast scanner. This scanner was installed at Royal North Shore Hospital, where Tom Reeve was our senior medical consultant on the project. The change in image quality was dramatic. Grey scale imaging allowed us to demonstrate, contrary to the generally held opinion at that time, that most malignancies were hypo rather than hyper echoic as described by Wild and Wagai. Dave Robinson and I implemented grey scale on our obstetrical scanner early the following year, with Bill Garrett as our medical consultant. For the first time we could visualize the chambers of the fetal heart, identify the fetal umbilical vein in the fetal liver and, as an immediate pay off, visualize with near 100 percent accuracy the placenta. Bill Garrett and I mounted a display of our images at the next WFUMB Congress held in Rotterdam in 1972. The interest in these was dramatic as no one had seen such images previously. 1973 Establishment of ultrasound of the neonatal brain.That year a fetus with ventriculomegaly was observed leading us to determine if we could achieve similar results in the neonate. In consultation with radiologists from Prince of Wales Hospital, ten neonates undergoing air ventriculography were also examined by ultra-sound. Ventricular sizes measured by both methods were in agreement and all further neonatal patients from that hospital were examined by ultrasound only. 1975 Research conducted by the Section differed significantly from that undertaken by the Commonwealth Acoustic Laboratories. Encouraged by our clinical successes and interest in the equipment by clinicians and industry, the Section was formed as an independent Ultrasonics Institute in the Department of Health. 1982 I was elected President of WFUMB for the following three years. 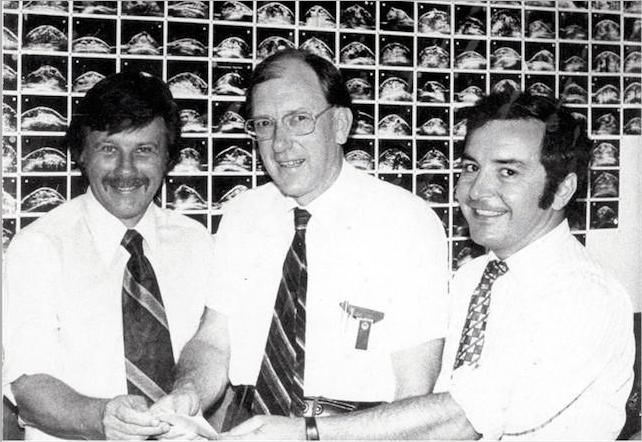 The Sydney WFUMB Congress was held in 1985 and attended by over one thousand delegates. The staff of the Institute played a major role in staging this Congress. 1989 The Ultrasonics Institute was transferred to the CSIRO (Commonwealth Industrial and Scientific Organisation) and renamed the Ultrasonic Laboratory. 1997 The Ultrasonic Laboratory was closed signaling the end to uniform ultrasound research in Australia. 1999 I was awarded the AO, an Officer of the Order of Australia. What are your impressions of the ultrasound technology available today ? This is a hard question for me to answer, as I have been retired for 15 years. My impression is that ultrasound technology has matured. The equipment is using modern computer technology, the frequency range has been significantly enlarged and a variety of functions have been incorporated in the equipment to facilitate its use in a variety of applications. Ultrasound has been accepted by a range of specialties, and some of the challenges of today relate to the provision of education and training in the correct use of the equipment in professions where the technique forms a small component of the practice. Challenges and opportunities still abound. I do not know the status of ultrasound contrast agent and this could well be a major application. I am surprised that modern equipment still does not provide quantitative measurement of blood flow. The use of two dimension-al transducers appears to have stalled. The problem of overlying tissue aberration has not been solved. So opportunities exist but how well they will be addressed depends on funding in a climate where interest has shifted to MRI and molecular imaging. Are you still involved with the ultrasound world ? I try to follow the ultrasound literature as I am in a fortunate position to receive major journals that feature ultrasound. Until recently I have been involved with the WFUMB Council as member of its Committees on History and on Archives. At the request of Michael Claudon, Barry Goldberg and I put together a paper ” History of Ultrasound and its Presidents”. This paper is published on the WFUMB website in the section on History. Today I am not involved with any ultrasound activity.